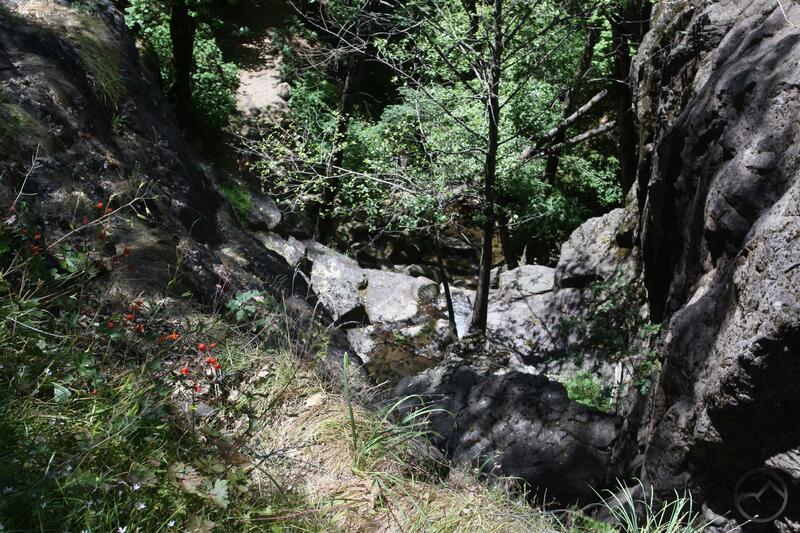 A very short but extremely scenic trail leading to an attractive waterfall and a great view of Mount Shasta and the Sacramento River. 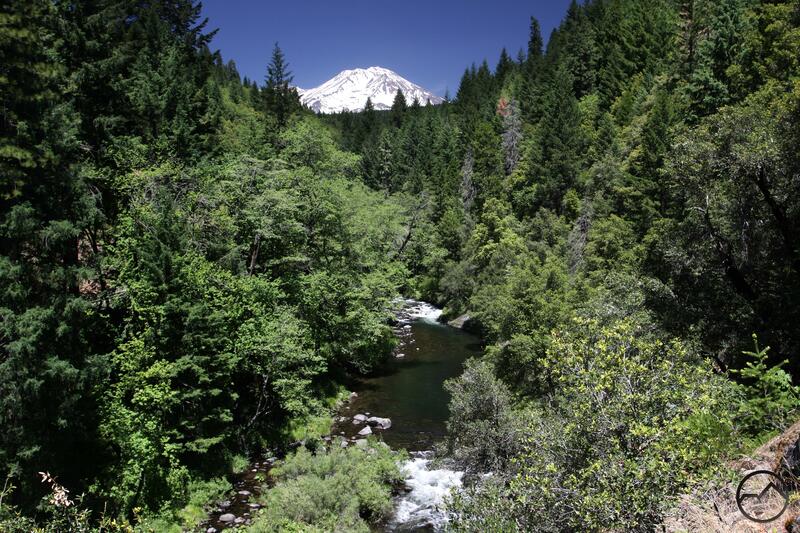 As I-5 leaves Dunsmuir and begins its climb up toward Mount Shasta drivers may notice signs proclaiming the park at Hedge Creek Falls. Although many travelers may be curious about the waterfall, they often do not stop and continue on toward the giant volcano further up the highway. 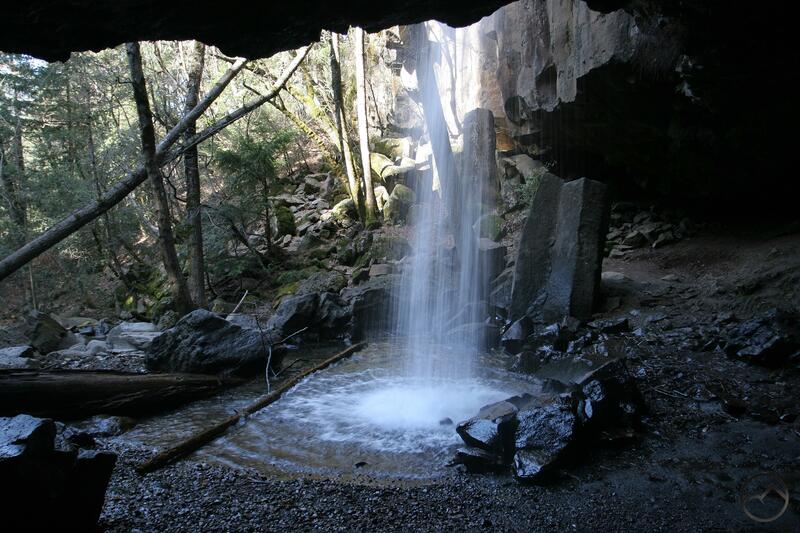 This leaves Hedge Creek Falls and its accompanying trail to locals for the most part. What they miss is a very nice waterfall and a short but extremely pretty trail that has far more to recommend it than might be expected. Of course, the primary attraction is Hedge Creek Falls itself. 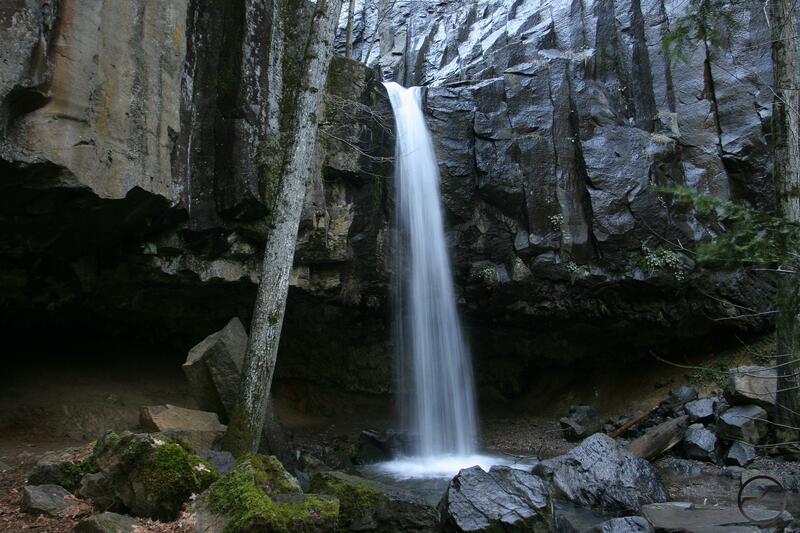 The cataract is about 30-35 foot plunge that pours out of large notch cut through a hanging wall of columnar basalt. It is not a grand sight but it is very nice. What does set the trail apart from other paths in the area that lead to waterfalls is the route’s passage behind the waterfall. The columnar basalt has collapsed at its base, creating a large cleft through in the rock through which the trail passes. From there it descends downward along Hedge Creek, passing numerous smaller cataracts before finally ending at an observation deck high over the creek’s confluence with the Sacramento River. From here there is a fantastic view of Mount Shasta. This is a great trail to do with small children. The path to Hedge Creek Falls begins at a small picnic area that is situated just across the road from the parking area. There is a table, gazebo, water fountain (only operational from late spring to fall) and some displays about the area. The whole area is perched right on the edge of the canyon above Hedge Creek. The trail departs the picnic area and descends at a very moderate grade. 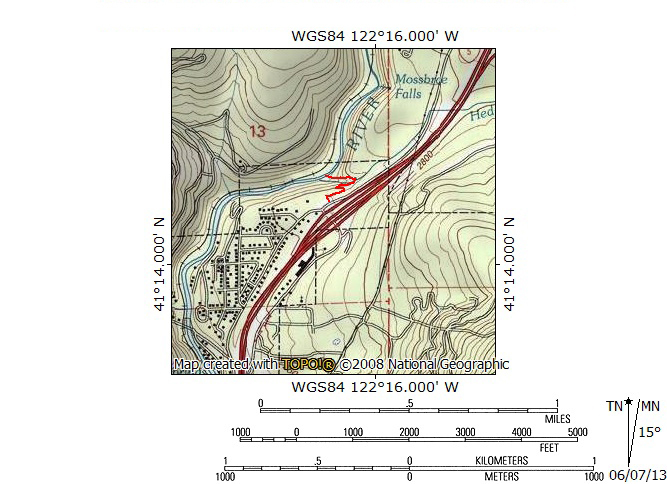 It immediately crosses over a small stream that has been rerouted under the trail through a culvert. The creek may or may not be flowing. The one drawback to the trip to Hedge Creek Falls is the presence of poison oak and this area has the highest concentration of the obnoxious plant. As the trail proceeds, it traverses the increasingly steep slope of Hedge Creek’s canyon. Soon the path reaches a switchback and the falls and its creek become audible. The trail continues downhill for only a few dozen yards before reaching another switchback. The grade levels off as the trail soon arrives at the waterfall. Hedge Creek Falls is a scenic little waterfall. It is more intimate than grand. This is due to size of the waterfall, the chance to get close to it on the trail and fairly unusual opportunity to travel behind the falling water. The most notable element of the waterfall is the cliff through which it flows. The wall is composed of columnar basalt, a formation caused when lava cools and cracks forming vertical, roughly hexagonally shaped columns of rock. The wall is actually about 10 feet above the ground because there is a cleft cut deeply into the wall’s base, creating a cave of sorts. The wall is a popular destination for rock climbers and if they are not present while hiking the trail, some of their protection attached to the cliff can still be seen by careful observers. 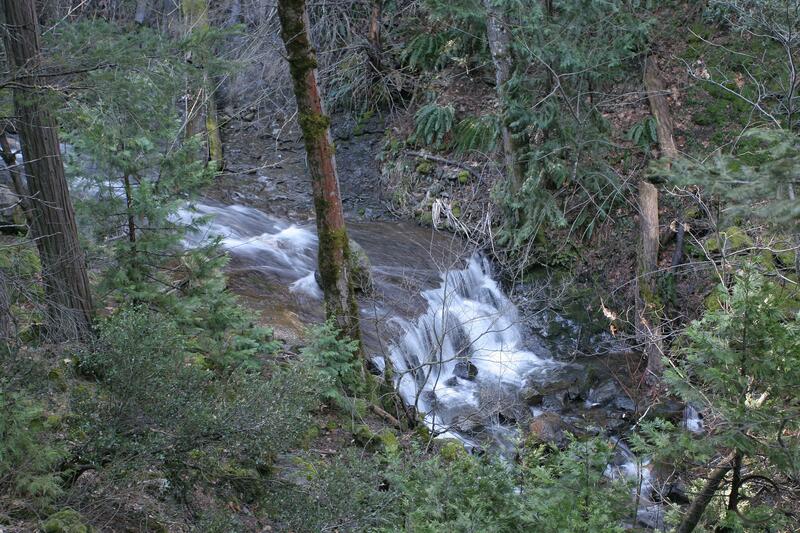 As the trail approaches the falls it comes alongside the creek as it heads down canyon towards the Sacramento River. The path becomes a little rockier as it passes the falls and enters the cave behind the waterfall. Rocks form stepping stones to avoid the muddy ground. Hedge Creek below the falls. Once on the far side of the falls the trail continues down the canyon. Unlike the first part of the hike, the trail now parallels closely alongside Hedge Creek. There are numerous small waterfalls and some interesting waterslides formed from the creek flowing over large smooth rocks. There are some particularly attractive falls near the end of the trail, which continues only a few hundred yards after passing the waterfall. After covering the short distance from the falls the trail finally arrives at an observation deck hung over the Sacramento River. 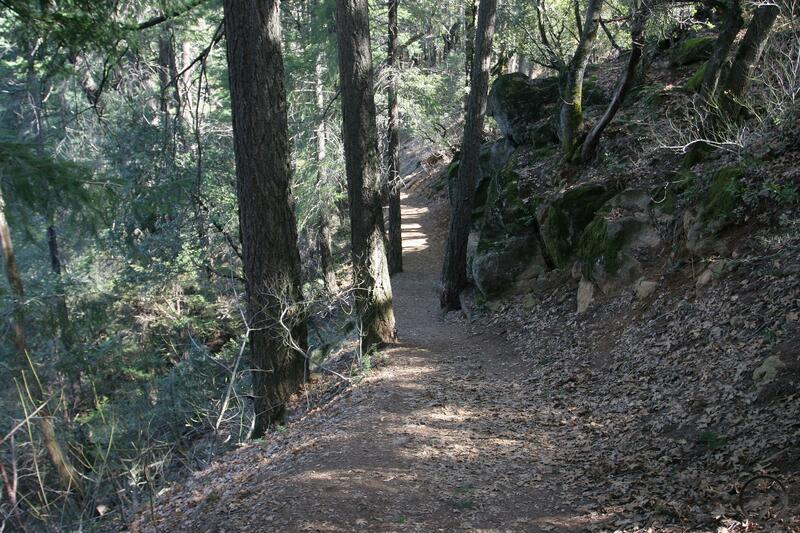 Just to the left of the observation deck, there is an unofficial but well established use trail that drops down to the confluence of Hedge Creek and the Sacramento River. Here there is a good swimming hole followed by a shallow area with some easy rapids. It is a nice area to play in. Looking down on Hedge Creek Falls. Though it is packed with a lot of scenery, if the Hedge Creek Falls Trail has a drawback, it is that the trail is short. For those looking to extend their time at the falls a bit, there is a very rough and very unofficial route to the top of the falls. It can be reached two ways. The first is to walk north along the road from the parking lot about 70 or 80 yards and then cut briefly through the trees down to an obvious path. Unfortunately there are no definitive markers indicating where to do this some route finding is necessary. The other option is to hike the trail to the first switchback and the climb up the slope 30 or 40 feet to where one crosses the unofficial path. Follow this until it fades out, which is above the falls. From here it is easy to climb down toward the creek. USE CAUTION here because the ground can get slippery depending on the weather. Above the falls the creek has formed a nice little slot through the basalt. There is a smaller waterfall above Hedge Creek Falls when the creek first enters the slot. Hi! Thank you for your amazing website, it is so helpful. I’m trying to find this place on Googleearth but when I put down the coordinates you provided, 41 14.000, 122 16.000, it takes me somewhere nowhere near California. Please help! I’d like to see where this is on a map. Thank you! 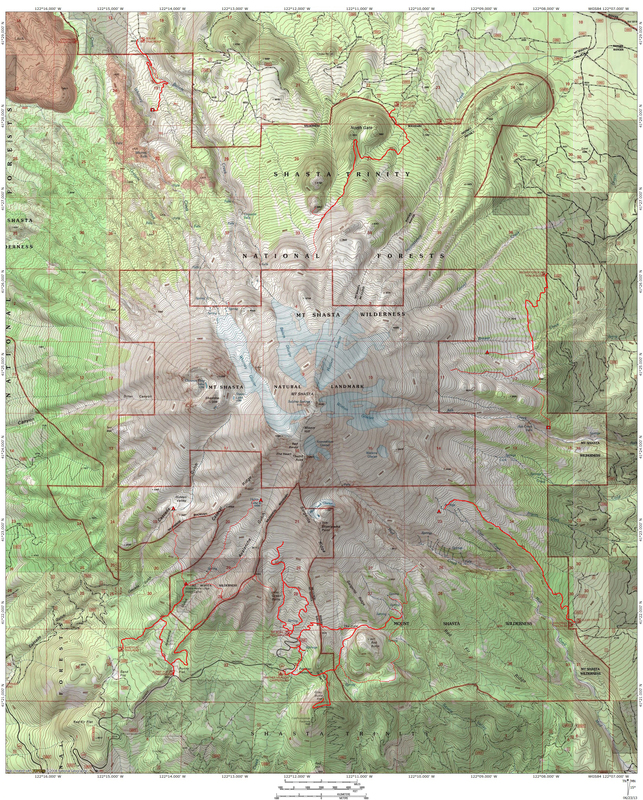 Hi is this hike and trail for beginners of all abilities? Even those who have dis+ABILITIES? To the first question yes. To the second, I guess it depends on what kind of limitations people have. Do not go at the end of August. The falls are just a trickle. Still beautiful and peaceful. If you have any issues, such as difficulty breathing, the hike out may be a little tough.